As a generalisation, less weight means less vertical force is required, which means small angles of attack, which in turn means low drag. From here it’s easy to see how modern materials and the dramatic reduction in the all-up weight of modern boats has helped to make hydrofoils more feasible. Taken to extremes, a modern Moth weighs just 30kg all-up, less than half the weight of its crew. But the theory doesn’t work for all lightweight, powerful boats; there is a limit. “Back in 2006 when we were designing Mike Golding’s Gamesa, we looked into the possibility of a fully foiling Open 60,” reveals designer Merfyn Owen. “An Open 60 is a pretty powerful boat and when you compare the sail area:displacement ratio with that of a Moth there appears to be evidence that a foiling 60 could work. 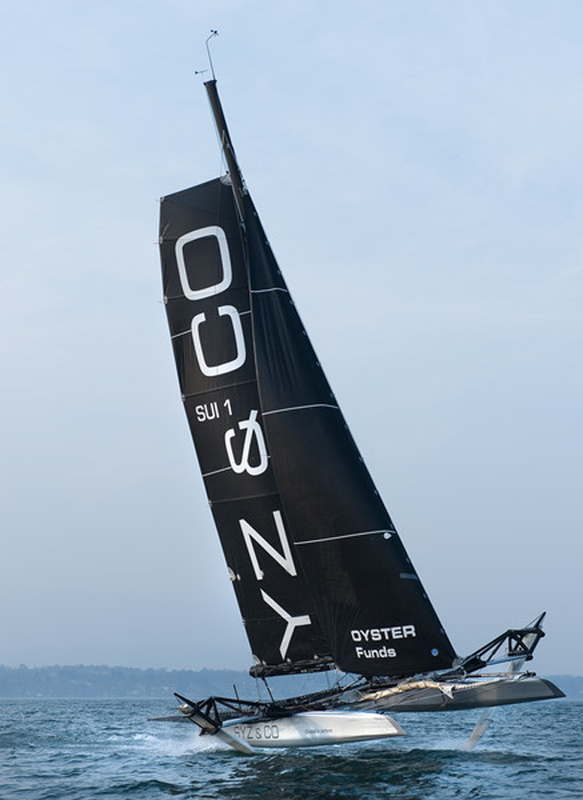 So if an Open 60 would struggle to get up, the prospect for other large foiling monohull keelboats is looking doubtful. Multihulls, on the other hand, are lighter for the same length and sail area and can generate huge amounts of righting moment without putting on weight, thanks to their wide beam. This makes them better suited to hydrofoils. But there are other problems to overcome and several key configurations to consider. The first issue is how much foil surface area you need to lift the boat. This varies with speed: the faster you go, the less you need. Early foil design used ladder-type racks of foils which lifted out of the water as the boat went faster, reducing the number of immersed foils as the speed increased. But this comes with a big drag penalty at slow speeds. Surface-piercing configurations, where the foils are angled in a V shape, also find their own natural ride height depending on the speed. As the boat accelerates, the foils generate more lift, raising the boat, which in turn reduces the amount of foil in the water until equilibrium is achieved. The boat finds its own ride height automatically, with no moving parts required. The configuration works in a similar manner with heel. As the boat heels to one side, more foil is immersed on the leeward side – and less to windward – which helps to right the boat. This inherent stability makes the surface-piercing configuration a popular one – it can be seen on boats like L’Hydroptère. But the problem comes at slow speeds when the high drag of the fully immersed foils hampers performance. Fully submerged foils, where the lifting part of the arrangement is a horizontal foil mounted under the water at the bottom of a vertical strut, offer the lowest drag, but they have to incorporate an additional element to control the ride height. In other words, the foil has to change its lift characteristics depending on speed. To do this, the horizontal foil has a moving element on its trailing edge like an aircraft’s elevator. 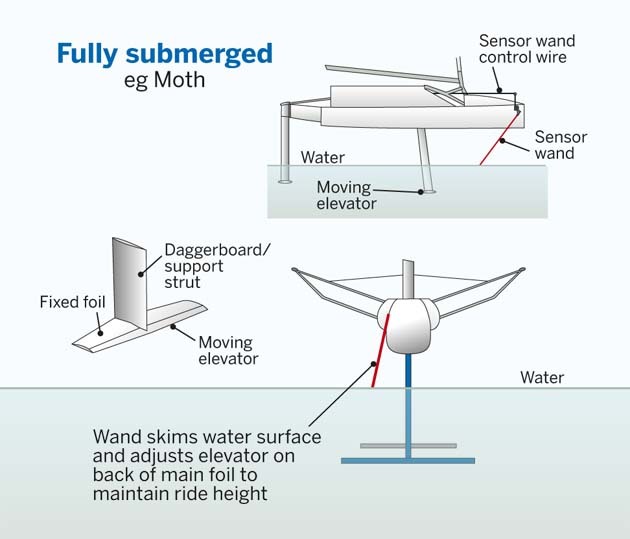 In the case of the Moth, this elevator is connected mechanically to a ride height sensor, a wand that skims across the water’s surface. The lower the boat is travelling above the water, the more the elevator is deployed, creating more lift. But as the boat accelerates the lift increases and it starts to rise. The wand then takes up a different angle from the water’s surface and reduces the deflection of the elevator, reducing the lift. Apart from the difficulty of following the sea’s surface in big waves, the problem for most sailing boats, especially keelboats, is that this configuration doesn’t provide any athwartships stability. The Moth stays upright because its crew hikes to windward. The same is true for other dinghies and cats that use crew weight for righting moment. On monohulls it’s difficult to make the configuration work.